The House of Representatives approved the GOP Tax Bill (Tax Cuts and Jobs Act) on Tuesday by a 227-203 vote and sent it off to the Senate. Before they could call for a vote in the Senate, Democrats found three provisions in the bill that violated Senate budget rules. One provision would allow parents to use college savings accounts to pay for homeschooling of young children. Those provisions were removed before the Senate could vote. 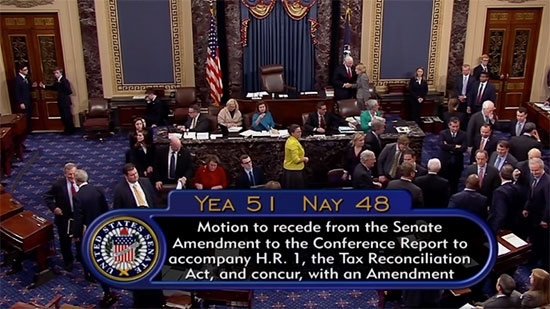 After some debate, the Senate voted 51-48. The bill will go back to the House for a revote on Wednesday. It is expect to pass again and make its way to President Trump's desk tomorrow. It will be the first major rewrite in the tax code in 31 years. Federal officials investigating the fatal train crash near Seattle, WA, yesterday say that the train was travelling 50 mph over the speed limit when it flew off the tracks over a highway overpass. Bella Dinh-Zarr of the National Transportation Safety Board says that a data recorder found in the rear locomotive recorded the train going 80 mph. That stretch of track along a curve and over the I-5 is a 30 mph zone. It happened at 7:34 a.m. Monday. It was the inaugural run of a new passenger route over refurbished freight tracks. Positive train control that can automatically detect and slow down a speeding train was not installed along this stretch. The crash is similar to a deadly Amtrak crash here in Philadelphia in 2015 where the train was speeding around the curve at Frankford Junction before flying off the tracks. Positive train control was not in place at the time, but has since been installed from Boston to DC. A Montgomery County school district has reversed course and decided to go forward with a multimillion dollar building project that just weeks ago they voted to stop mid construction. The Upper Perkiomen School Board debated for hours on Tuesday and voted 5-4 to resume construction on a new middle school for the district in Pennsburg. At the beginning of December, the same board voted 5-4 to halt building the $55 million project despite already spending some $10 million and breaking ground. It would cost an additional $18 million to buy out the contractors contracts if they had had decided to stop. No word on when the project will pick back up.